Set aside a day for a trip to a place where time is suspended. 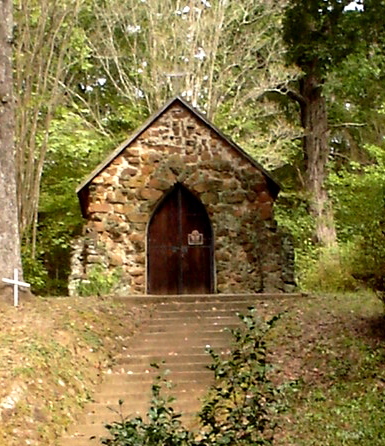 Cradled in a thicket of mixed hardwood, above an ancient thirsty bayou banked with native stones, sits a tiny rock chapel with two gothic windows. This chapel with frescoed walls and ceiling murals was built in 1891 by German missionary monks with names like Schweitzer, Scherer, and Kuavl; three others lie in unmarked graves that flank the entrance. A retreat for monks, the chapel also was a site for weddings, Easter services, and celebrations. These men of a Carmelite order assigned to Bayou Pierre settlement now known as Carmel, endured extreme hardship in the frontier, as had earlier French and Spanish pioneers. In this wilderness, starvation and illness (perhaps plague) visited this devout group, and gravestones reflect their deaths at early ages. When church and monastery were destroyed in 1904 by a trash fire, only the chapel was spared. History wrapped brambles across the path to the chapel as tapestries fell, paint faded, and people forgot to come. Restoration began in 1959, and was completed in 1961. To find this treasure, take Exit 17B/I-49 S. At Exit 177/509 go south to Carmel. Turn left at Carmel Baptist Church. Continue to Lafitte Custom Mill and turn left. In about one mile, you’ll see the cemetery and church. An arch is entrance for the quarter-mile walk. Stop at Lafitte Mill for the key. ~ by Voltima on January 23, 2010.